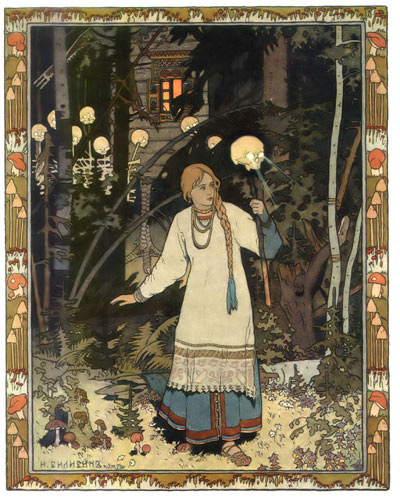 Baba Yaga. Even the name sounds retching. She is the Crone: all bone-crushing, baby-killing nastiness. That object that she’s flying around in is a mortar and pestle, which is a little bowl, made of hard, dense ceramic material or rock/granite, and a stubby club-like instrument made to grind spices and concoct potions/herbs in. Cooks still use them, I guess because grinding spices in this old-fashioned way may increase the flavor of the spice. Okay, this isn’t a cooking lesson, but I do think it’s interesting to note that in many stories of witches and bad grandmas, kitchen utensils are the weapons or modes of transportation of choice. Women reprsent many powerful aspects of basic human needs: they give birth, they cook food, and they guide and protect humankind. But to every yin there’s a yang, and for every story of life-giving, there’s life-taking, for every home-cooked meal, there’s a poison apple, and for every act of guidance and love, there’s a “throw you into the fire just as soon as my gingerbread cookies are done.” Talk about mixed messages! And what is going on with the chicken-legs walking house? If you were going to bewitch a mobile home for yourself, wouldn’t you choose something other than chicken legs? Although fried chicken is delicious, and there’s a shortage of pumas in Russia. It’s those little details that make a story represent its culture, its time, and its society. 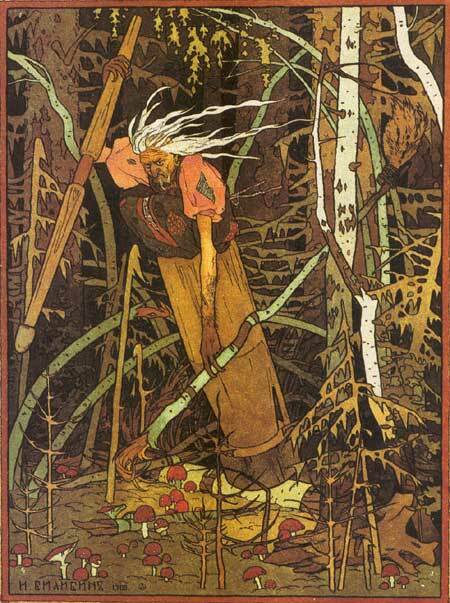 Think about that: if Baba Yaga’s hut moved on tiger legs, it would be an anachronism, something out of its time and place. Sort of like seeing someone use a cell phone in a 1870s Western. Previous Myth-of-the-Month Club: No need to PANic. Very interesting, both story and the fairytale website.